While we offer a full range of marketing services, our aim is to keep things simple. From SEO to web design, our team of experts will take care of your biggest challenges. Except for your ever-growing inbox – that’s all you. The frank Agency is a full-service agency. That means we do all the things one would expect a full-service agency to do. But that doesn't mean we have to do all of those things, all of the time, for all of our clients. When we work with you, we offer you the services you need to generate the results you want. Of course we're well-versed in all disciplines. But it's the discipline it takes to remain focused on your bottom line that keeps us grounded. And what makes us work harder and smarter for you. Your brand is everything. And we treat it as such. In other words, we do everything in our power to develop a meaningful, resonant brand that customers desire. Who says direct marketing can’t be both beautiful and effective? Certainly not us. We know the goal is to get someone to act, but first you have to get them interested. Still think social media isn't worth the trouble? Spend a lunch hour watching that coveted 20-30 demo work their phones and tablets. It's not enough to write compelling marketing emails. Not even close. Our theory is simple: it's not a smart device if you put something stupid on it. That's why we're leading the way in intelligent, thoughtful digital design and development. As of this writing, there are 1.88 billion indexed pages on the World Wide Web. We're no mathematicians, but we're pretty sure that's a crazy big number. 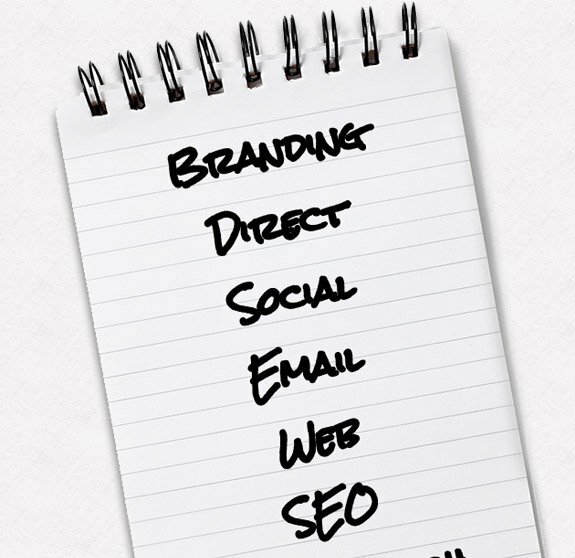 We manage more keywords than you'd find in a dictionary. 16 Funk & Wagnall's dictionaries, to be precise. If a tree falls in a forest and there’s nobody there to hear it, well, then, that tree must have had a pretty lousy media department.